It is an enormous sacrifice but you cannot leave a person living with dementia at home alone. They just can't deal with it. At a certain point in the development of dementia, as the dementia progresses, a person cannot be left alone. Dementia patients do not "cope" well when left alone. Did You Know Dementia Patients Get Agitated When Left Alone? Our reader Blackfin66 left this interesting comment and question under the article, When Alzheimer's Patients Say Mean Things, What do you do? I'd especially like to hear how you dealt with the bad reaction to leaving the house for a while. I understand that my wife does not like to be left alone, and I think I understand why. But there are occasions when I do it anyway. To be honest, I feel that I have already greatly limited my activities to stay with her and there are times when I need a little time to myself or a little time to socialize. I never go for more than 2 or 3 hours (usually less) but it is always guaranteed to make for ugly comments. The good thing is that she gets over it in an hour or so....maybe that is as good as it gets. It took me a while to understand how my mother might be feeling when I went out and left her alone at home. I finally came to the understanding that she felt abandoned, confused, and scared. Scared to be alone. At a certain point in the development of dementia, as the dementia progresses, a person cannot be left alone. Dementia patients do not "cope" well when left alone. You could ask yourself this question. If the person who is left alone is angry when you return, how do you think they might have been feeling while you were gone? Alzheimer's patients are very fragile. As the disease develops they don't have any real concept of time. To a person who is deeply forgetful 30 minutes might seem like an entire day. For example, I might go to the store for 30 minutes and leave Dotty alone at home. She would be very angry when I returned. She would often act out. Article - "Get out, I don't need you, I can take care of myself"
Later that night she might say to my sister Joanne, I don't know where he goes, he goes out all day long. She said this even though I was only gone for 30 minutes I and I went to the store. Clearly she had no understanding or any memory of how long I was gone, and why I was gone. Dotty might also say, I don't know what he is up to. This was code for Dotty thinking or believing I was going to put her in a "home". Like any feelings or emotions in any of us, if you let these type of thoughts build up over time it is likely that you are going to "lose" the dementia patient. When I say "lose" what I really mean is lose their trust. If they don't trust, or stop trusting you, you are really in for some very miserable times. If an Alzheimer's patient does not trust you they will become angry, irritable, challenging, and hard to deal with. When this happens you both suffer the burden. The person who is deeply forget becomes confused, then angry, and then they "act out". You on the other hand get left with an upset stomach (agita), and a very sore heart. Has this happened to you? Some caregivers complain that they can't get a minute of peace. That the person who is deeply forgetful follows them around, or constantly calls out for them when they cannot see them. Dotty did this all the time. 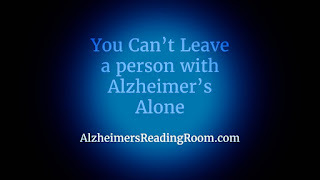 Article - Alzheimer's Care Why are the Little Things Bothering You? Lets reverse field. Instead of "venting" and complaining about the behavior of a person that is deeply forgetful, lets instead ask ourselves, why do they follow us around, why do they call out when they cannot see us? The simplest answer to this question is because we are their lifeline. We are the person they trust (maybe the only person). We are the person that keeps them attached to the real world. Like it or not, you become the one person in the world that a person who is deeply forgetful can rely on and trust. You are the only person that can keep them from becoming confused, angry, and just downright scared. It is rather simple, after a certain point in time a person who is deeply forgetful gets scared when left alone. This in turns leads to all kinds of negative behaviors. Blackfin, your situation is only going to get more difficult, not easier. Sooner or later, a person who is deeply forgetful cannot be left alone. You do have some alternatives. You could start to cultivate neighbors or friends and leave your wife with them from time to time. Or, you can have them come over and stay with her when you go out. Or, you can hire someone to be there while you are gone. It would be much wiser to start introducing one or more of these alternatives now rather than later. Get the pattern established as soon as possible. How did I cope with this? Simple, I rarely left Dotty alone for longer than a few minutes. I usually ran to the trash, or over to the pool when she was sleeping. Believe it or not, I sometimes took the chance and went to the grocery store (Walmart) at 1 AM. Yep, they are open 24 hours a day. I also took her with me on dates and to parties. There are many wonderful people out there and they get it. If you want to get on the path to Joy, and off the path to Burden, you will be required to gain the trust of the person who is deeply forgetful. You will be required to think about how they are feeling. For example, how they are feeling when you are gone. 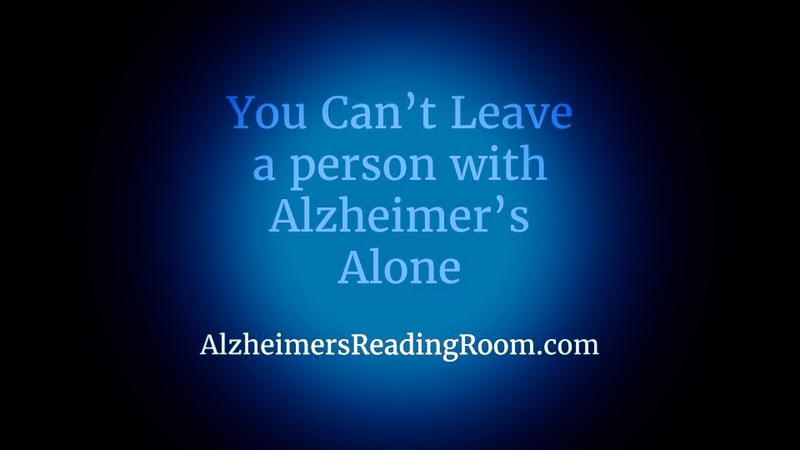 Learn More - How can you help an Alzheimer's patient? You get to decide. Yes, you will be required to make an enormous sacrifice if you decide to keep the person who is deeply forgetful at home, like I did. You must choose. Burden or Joy. Of course, this does not mean that you have to do what I did. There are good alternatives like adult day care. Title: "You Cannot Leave a Person Living with Alzheimer's Alone"
My husband has been diagnosed with Alzheimer in 2016 there's a herbal foundation in Johannesburg they cured my husband Alzheimer's disease . Pm me i will give their details. People can search about them on Google or youtube(total cure herbal foundation). My husband faced many difficulties and was in several depression, Trouble understanding visual image, aggression ,so many,. This thing happened to him in very crucial stage of our life. PM if someone needs info or buy direct from them totalcureherbsfoundation .com they cured 100% of Alzheimer with their herbal formula . Singularly unhelpful and insensitive to caregivers. you should give a try on their products.